Made it to Nawlins! My buddy Myron actually ended up here the night before because he mixed up the dates (doh!) so he was here when I got here. 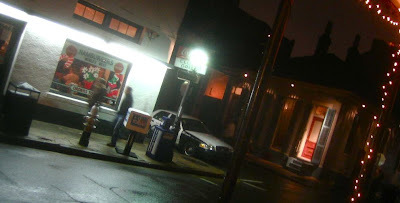 Was a rainy day and night in the Big Easy, but it was easy to see how things were ramping up for new years, especially with Bearcat and Gator fans in for the Sugar Bowl. A plane full of fans makes for an unusually upbeat travel experience. Our attempt at grabbing some muffalettas was thwarted by a broken oven, so we settled for poboys instead, still not a bad first meal in New Orleans (as if any meal is ever bad here). We couldn't be any more central - our apartment is the place with the red door in the middle pic; right next to the Clover Grill and across the street from the bar. We can't help but stumble out into the middle of everything. I was pretty exhausted from the travel and never getting myself on an east coast schedule, so it was hard getting out last night (even though it was only a few steps out the door! ), but once we did it was a fun night of beer, kareoke, and crazy characters that New Orleans always somehow manages to bring out.